Beachcombers Bazaar Henna Studio and Supply: Instructional Henna CD by Bajidoo! 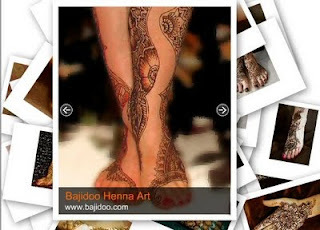 Brenda, of Bajidoo Art, has created a fantastic henna instructional book, "Henna, Self Taught". I'd love to offer it (it's beautiful), but it's not in our price range. Luckily she has put the book on CD and added a bunch of great information to it! The Henna CD covers the basics of henna including mixing henna, but it goes into depth about creating artistic henna designs easily. It really breaks up the artistic part of mehndi and makes it easy for anyone, no matter what artistic ability you have (or don't). The CD is a bargain for what you get! I immediately bought one for myself. I have a limited supply of these, so if you want one, get it before they are out. You can purchase the "Henna, Self Taught" CD e Book here.